In addition, as part of her grant Yulia takes part in various cultural and professional events. Among the most important ones were an official reception at the Presidential Club at Indiana University for the academic staff of the Institute of Russia and Eastern Europe and Fulbright Scholars, a meeting with the director of the Institute of Russia and Eastern Europe at Indiana University, dedicated to the discussion of the future prospects of a possible professional collaboration, and a round table with the Director of Disability Resource Centre, in which participants shared the Russian-American experience of overcoming possible difficulties in the training of persons with disabilities through the use of innovative technical, technological and methodological approaches. Besides this, during her stay at Indiana University Yulia was selected to participate in a seminar in Alabama, dedicated to democracy and human rights. As part of the seminar, she raised the issue of constructing a system of full inclusion of disabled people into society. 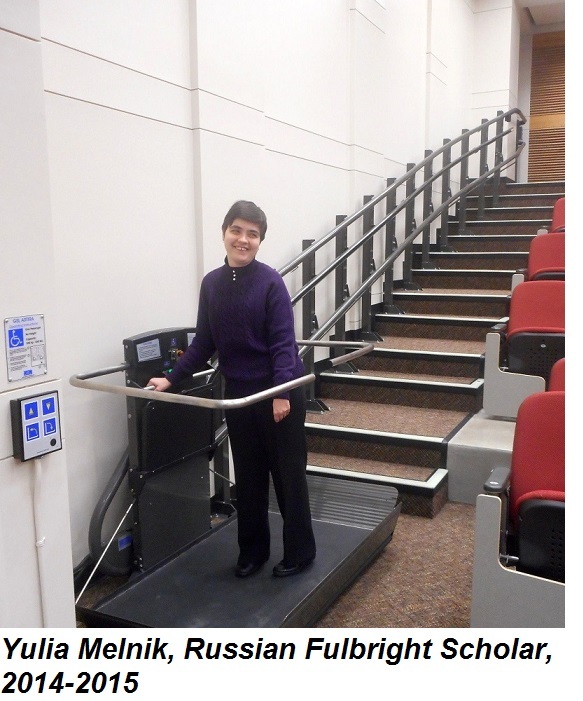 During her participation in the academic and cultural events, Yulia got acquainted with innovative strategies of including persons with disabilities into society on either emotional and personal, or technical levels. Into the first one we can include the following basic cultural and ethical rules of behavior and communication with people with various disorders. The second implies a mass dissemination and use of various devices for persons with disabilities, such as ramps, lifts at universities, buttons on the entrance doors, located at the level of the hands of a person in a wheelchair and intended for automatic door opening, colored markings on cross-roads for people with vision problems, audible traffic signals, braille in elevators and other public places, etc. The cultural part of the workshop held in Alabama included a visit to the George Marshall Space Flight Center, local schools and families, as well as a reception in Alabama consulate. “I kept trying to "keep the brand" of a cultural envoy, – Yulia shares her impressions – and it seems to be a success. We were set a very friendly attitude from both organizers and participants of the seminar. Honestly, it caused a great surprise that I am from Russia, with a disability, but so young (many people quite seriously claimed that I am 18-19 years old, and could not believe that I am actually 26!). Since the time of my formal presentations was strictly regulated, after them I used to gather around informal "round tables", where all participants asked me about the academic interests, Stavropol, university, personal experiences, etc. I have photographs taken with so many new friends: from Mexico, Brazil, Vietnam, Palestine, Pakistan, Africa, Finland, Korea, China, Latvia, Lithuania, Finland, Indonesia, Turkey, Romania and Belgium. Everybody was asking me for permission: if they can show pictures and tell about me in their own countries. So, if suddenly one day you see my photos somewhere – do not be surprised, this is actually me!"